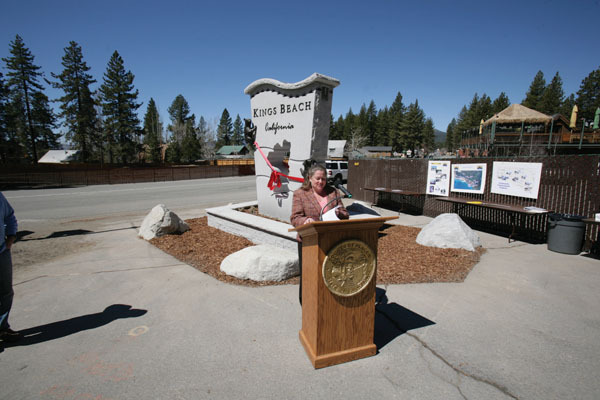 Ryan Slabaugh/Sierra SunPlacer County District Supervisor Jennifer Montgomery, who represents Kings Beach, speaks to a crowd of 30 or so on Monday during the unveiling of a new monument in Kings Beach. Other revitilization efforts will occur across the street and to the right of the photo, as part of a larger effort to reduce blight in the unincorporated town. KINGS BEACH ” In a crowd full of politicians and Tahoe area leaders, Scott Arterburn stayed quiet. Arterburn stood in the back and watched as three Placer County supervisors gave speeches about the future of eastern Placer County Monday morning. Under a big blue sky, they shared a grip on pair of giant yellow scissors and cut a ribbon surrounding a 25,000-pound piece of stonework greeting drivers entering Kings Beach from the east. But Arterburn watched with a little more interest than the average spectator ” he built the monument. “That’s a pretty big piece,” said Arterburn after the ribbon-cutting. His company, Chilcoot Monument out of Portola, Calif., produces 200 monuments per year. “It’s the single heaviest piece I’ve ever done,” he added. Arterburn found the rock near Yosemite in what he says is the only quarry big enough to produce a single piece. The rock was then shipped to Minnesota, to the only lathe in the country large enough to cut the slab. Two bear cubs created in Jackson, Wyo., and made of bronze, were then fitted to the monument. For the elected officials, the unveiling symbolized the upcoming Kings Beach revitalization project, which began more than five years ago and includes converting the highway down to three lanes, installing a roundabout and creating new commercial options along the main drag. The new stone monument sits on land that used to belong to a run-down gas station that often leaked fuels into the lake. “This is a symbol … It’s not just a reflection of what we did, but what we’re going to do,” said District Supervisor Jennifer Montgomery. Kings Beach’s own Burdick Excavating Company completed the clearing and erosion control work to make space the 13-foot-high monument. Placer County Supervisors continued meeting on Monday afternoon, hearing talks from the Tahoe Regional Planning Agency. Supervisors are scheduled for the official Supervisors meeting on Tuesday morning at Northstar-at-Tahoe, one of two times they meet in eastern Placer County each year. The next gathering is planned for July.